The basic idea to build the GJJS Foundation - a not for Profit organization - was born during conversations with the 2 GJJS Founders and City of Parksville Councillor Al Greir. The official Foundation registry process was completed in May 2009, a first Board meeting was scheduled the same month. The sole goal of this organization is to build a link between the GJJS Social Enterprise and City of Parksvilleâ��s basic interests to decrease violence and vandalism. The Foundation is positioned to develop and control special tailored programs with the input of all involved parties, such as City of Parksville, RCMP, Downtown business association and others. Fundraising activities for special developed programs will be initiated by the GJJS Foundation and the developed and outlined programs will be outsourced to GJJS for realization. I am happy to support and promote the GJJS program that encourage our youth to stop the violence. Too long in Parksville have we lamented about the youth in our community and the problems that they cause. Now we have a concrete program that is tailored for the youth in our community who have been marginalized by various factors in their lives. This program provides a safe environment for them to develop greater self esteem and self confidence which in turn provides them with tools to avoid getting into trouble because of peer pressure or boredom. With this exiting program Sensei Joe Friede and Sensei Jeremy Buerge, not only challenge the youth physically, they challenge their belief and value systems and provides them with a sense of belonging in a positie way. From my perspective it is time the City of Parksville invested in all of our youth and as a City Councillor I am fully supportive of this program and look forward to seeing our youth become more productive members of our community. The Founders of GJJS ( Jeremy Buerge, right & Detlef -Joe- Friede, left) are blessed with an incredible support on different levels throughout community and Society. It seems that an incredible amount of like minded people are coming together, through all our initiatives, products and services and personal involvements. 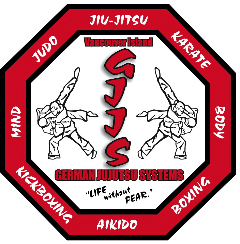 The GJJS program â��Life without fearâ�� involves the teachings on self defense moves such as strikes, blocks, kicks, throws, locks, kata, weapons, Body and Mind connection and competition. The established curriculum provides a 50% mental and 50% physical training experience, which in principle will be special tailored to ones individual needs. In Western terms, mental training takes the form of anxiety control and the cultivation of a level of optimal mental arousal. The main purpose of practicing German Ju Jutsu is to incubate a sense of self-worth by presenting a structured activity in which students can measure their performance against agreed goals. Since the practice of Ju Jutsu involves working with other people, a secondary spin off is the sense of responsibility and respect generated by he need to depend on others. The techniques are taught in a semi-informal, but completely controlled atmosphere, which instills a sense of discipline in all those who practice it. The highest priority during all training or class situations is the health and safety of all involved parties and training participants, which provides the foundation for the opportunity to change on both ends of the scale: being at present a victim or an offender. Any form of misuse during training or real life situations will not be tolerated and has strict consequences. Attached to any physical training component is an equal mental component, which has to be trained and accomplished by the student. Ju Jutsu is a traditional Martial Art and in consequence, its techniques involve a potential risk to participants and third parties. This risk is minimized through the risk assessment of every student; the operation of a suitable syllabus for young people which omits those elements which could be used in situations outside of the GJJS Dojo; the presence of mental training which seeks to cultivate those attitudes conducive to a socially responsible attitude. methods to create ones personal mental switchboard for effectively surviving and dealing with violent confrontationsÂ - Â through changing into a â��warrior moodâ�� - getting into a mindset of an Olympic athlete in seconds - a complete subconscious self defense mood and response - raising ones awareness level - shortening ones response time - reading offendersâ�� vibrations and levels of aggression or violence - realistic situation assessmentÂ - getting complete control during self defense situations - dealing with all tactical aspects of self defenseÂ in seconds - getting adrenalin production and heartbeat controlled - stress reduction - self-confidence & self-esteem - discipline Â - getting ones body and subconscious mind connected during stressfulÂ situations. Picture above:The Parksville Downtown Business Association presented $5,000 Thursday to the Vancouver Island German Jututsu Systems Foundation's Life Without Fear youth programs. 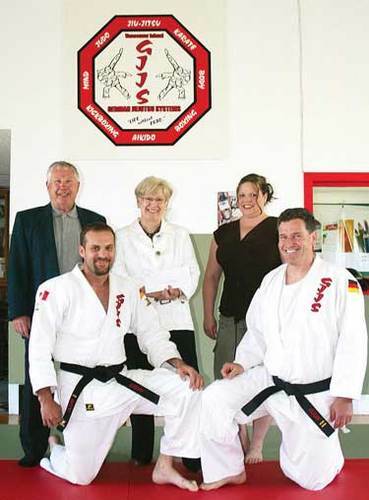 Kneeling in front are German Jujutsu instructors Jeremy Buerge (left) and Detlef 'Joe' Friede. Standing from left are Parksville Coun. Al Greir, a Foundation director, Ann Cameron, executive director of the PDBA, and Jennifer Buerge, of Vancouver Island German Jututsu Systems. The Parksville Downtown Business Association is getting behind a unique program to stop vandalism by area youth. The PDBA is joing the City of Parksville in supporting the 'Life Without Fear' program, operating out of the Vancouver Island German Jututsu Systems building on McVickers Street behind Thrifty Foods. The City owns the lot and building and is allowing the martial arts school to operate there rent-free for three years so long as it runs the program. Life Without Fear is governed by the Vancouver Island German Jututsu Systems Foundation with directors from the school, the City and the RCMP. 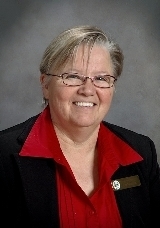 A director from the PDBA will soon be joining the board. PDBA executive director Ann Cameron says Life Without Fear fits with a PDBA policy of "working with youth where possible." A PDBA program of displaying art by youth downtown "really diminished" vandalism in the area, she said. 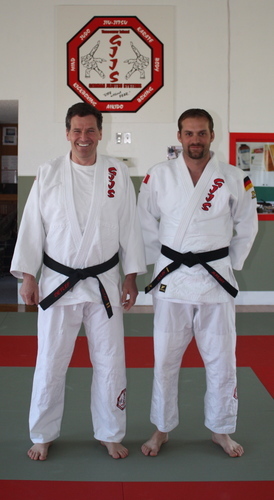 German Jujutsu instructor Jeremy Buerge said youth who come into the program, some voluntarily, some referred by the police, school district or social services, gain self-confidence, as well as a group of friends who become like a surrogate family. Instructor Detlef Friede said it also brings discipline to young lives which are often lacking structure. Buerge said one youth who was heading in the wrong direction was always being beaten up by "a friend." After being in the program only a few weeks, he said, the youth is no longer fearful when he goes out and is very enthusiastic about jujutsu. "He's completely turned himself around," Buerge said. The youth learn the program "is not punishment but joy, and they start coming in on their own." Starting next month, Friede said, the program will be starting "night classes" in which high-risk youth will be assessed by experts for their level of aggression so a program can be designed for them. One thing the program does, he says, is give youth a workout so they don't have the energy to go out and commit acts of vandalism at midnight. Often when they first come in, Buerge said, "they can't do 10 push-ups." Along those lines, Friede said, the program is looking at starting boot camps in September "for the most haywired kids." 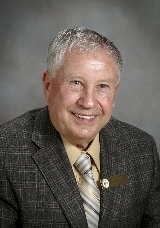 Parksville Coun. Al Greir, a Foundation director, said they're also looking at programs to develop leadership, including a Youth On Patrol program modeled on Citizens On patrol. Friede said they'll make sure the youth have proper training so there aren't young "SWAT teams" roaming the streets. Friede said he is also working with Victim Services to get young vandals or bullies and their victims together to encourage respect. Youth in the program may also be sent out to do the hard work of removing graffiti, he said, so they'll tell their spray-painting friends, "Hey, I have to clean this up." All of these initiatives add up to "a combined vision," he said, of turning destructive vandals into confident leaders. For more information, call the school at 248-3538.